Volkswagen CEO Martin Winterkorn, left, has received backing from Wolfgang Porsche, right, a key member of VW's supervisory board and chairman of Porsche. FRANKFURT (Bloomberg) -- Wolfgang Porsche threw his support behind Volkswagen AG CEO Martin Winterkorn two days after his cousin and Chairman Ferdinand Piech publicly criticized the CEO. "Dr. Piech represents his private opinion," Porsche, who sits on the automaker's supervisory board, said in a statement. "Content and facts have not been coordinated with the family." Piech told Der Spiegel in an interview published Friday that he was keeping himself "at a distance" from the CEO. Winterkorn is encountering growing opposition from supervisory board members due to sluggish U.S. sales and little progress developing a low-cost car, the German magazine reported. Wolfgang Porsche's comments further isolate Piech after labor leaders and the state of Lower Saxony also expressed their support for the CEO. The Porsche-Piech family, which controls the automaker through its holding company, usually speaks with one voice on strategic company decisions. The dispute comes at a key moment for VW as Winterkorn works to complete the last phases of an expansion plan that includes snatching the global sales crown from Toyota Motor Corp. -- a goal he may achieve as early as this year. Shares of Europe's largest carmaker have gained 37 percent this year, valuing VW at 117.8 billion euros ($124.9 billion). The Porsches have two seats on the 20-person board, while the Piechs have three. The state of Lower Saxony, where VW is based, has two seats and worker representatives hold 10 seats. Together, the Porsches, Lower Saxony and workers would therefore have a 14-seat majority and could easily prevent Piech from trying to remove the CEO. Should Piech lose, this would mark the first major defeat for the 77-year-old chairman, who's been on the supervisory board since 2002 and before that was the CEO for nearly a decade. He orchestrated the firing of previous CEO Bernd Pischetsrieder in 2006 and turned the tables on his cousin Wolfgang in his unsuccessful effort to buy VW. 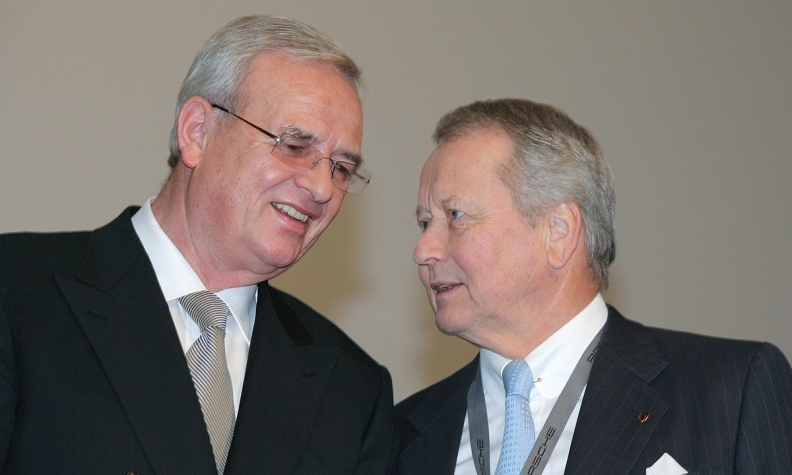 With Winterkorn's help, Piech instead led an effort that eventually ended with VW purchasing Porsche. Winterkorn now plans to fight for his post and won't let himself be easily pushed aside, people familiar with his thinking said Saturday. The 67-year-old CEO, who was surprised by Piech's comments, has the backing of others on the management board and is determined to prove his strategy will keep VW competitive in the long run, the people said. The falling out is startling because the two have worked closely for decades. Winterkorn has been seen by insiders as Piech's likely successor, a role that Piech said Friday will no longer go to Winterkorn. Works council chief Bernd Osterloh, who sits on the board, threw his support behind Winterkorn already on Friday. Employees historically have voted as one block to maximize their power. Lower Saxony has also backed the CEO. "We appreciate the work of Chief Executive Officer Martin Winterkorn very much," Olaf Lies, the state's economy minister, told Germany's Bild am Sonntag newspaper. The public shareholder is taking "a very calm view" of Piech's announcement "in view of the majority powers on the supervisory board."